When is the 18th Edition released? You should install any new work to the 18th Edition from July 2nd 2018, but if the work commenced prior to this date you can complete it to the 17th Edition. The 18th Edition is fully in force from 1st January 2019, so all jobs must be installed to it from that point onward. Why is there a 6-month grace period between issue & enforcement? So that larger jobs that may have been started in early 2018 can be completed to their original design. The IET feel six months is adequate time to complete existing work, and re-design any new work from that point onward. 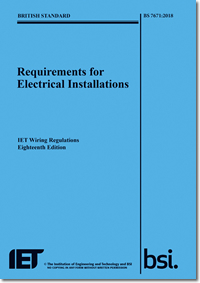 Does everyone in the electrical industry have to be qualified to the 18th Edition? It’s not just about where they work, it’s also about the voltages they work on. BS7671:2018 covers voltages between 0-1000V AC, so if you work on voltages within those parameters you should have the 18th Edition qualification. There are exceptions (boats, offshore installations, mines, quarries, etc. ), but these have their own regulations that must be followed. Is there an update course from the 17th to the 18th Edition? How long is the full course? It depends where you take it. Many Training companies run it over three days, but the required ‘guided learning hours’ are set at 18, so at DJT we run it over two days and allow two further days for revision before the exam. This means we can be cheaper, and save our delegates time & money. Can you have the Regulations in the exam with you? Yes, it is an Open-Book exam. Where can you purchase a copy of the Regulations? Most wholesalers sell the Regulations but so do the IET on their website and you can purchase them from Amazon and any major bookshop. How much do the Regulations cost? How long does the qualification last for? Until there is an amendment (and in some cases you will not even need to re-take it then). Have the On Site Guide and Guidance Notes been updated too? The On Site guide is already updated, and the Guidance Notes are in the process of being. By January 2019 all the IET Publications will be to the 18th Edition. Are there any new sections in the Regulations? There are new chapters & sub-sections and new Appendices, as well as numerous changes and additions to existing regulations. We will continue to charge £380.00 for the Regulations course for the remainder of 2018. We will then review the costs in 2019 based on the market value of the training. Does the 18th Edition affect Part P of the Building Regulations? Not in the short term. Part P was written in a different format specifically not to reference BS7671. Part P of the Building Regulations is open to amendments too, so if they see a reason to amend any sections due to the 18th Edition they will add it as an amendment . How quickly will the governing Bodies expect you to complete the qualification? By their next annual visit if you haven’t taken it already. Does it make a difference if I took the 17th Edition in the past two tears? No, except to say your knowledge of the structure of BS7671 will be more current, so the course may feel a little easier. How quickly can I get on a course? We take up to 16 delegates on each course, and we will be running a minimum of two open courses per month until the end of 2018. If you work for a company who employ 6 electrical personnel or more we can run a bespoke course for you at our Training Centre during the week.